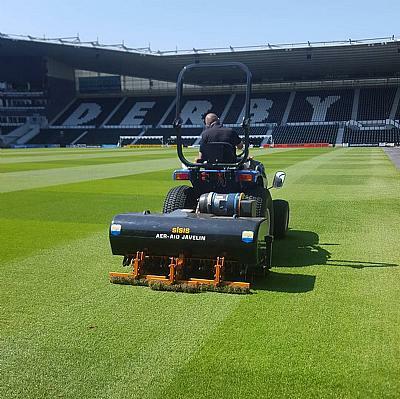 Nathan and his team of three groundstaff tend to the pitch at the iPro, which is of a fibre sand construction complete with under soil heating and is fully irrigated. After recently taking on the head groundsman position Nathan revealed that he wanted to make a difference – and it is for this reason that he turned to SISIS. “When I first took over I was looking at making ourselves a little more self-efficient, so one of the first things I wanted to look at was seeding, more specifically - regular over sowing during the season. This is why we chose the SISIS Variseeder. “The nice thing about the Variseeder is that it is compact - we don’t have a lot of storage space here so we actually have it on a little trolley and we roll it under the stands. It’s a really good seeder and does a cracking job. “We tend to use the Variseeder once a month. We just clean the pitch out with brushes and spikers and then we’ll put a small drop of seed across the whole pitch,” he said. The SISIS Variseeder is a versatile easy to use tractor mounted seeder with a variable seeding rate ideal for football field maintenance, golf course maintenance and for use on lawns and amenity areas. It has a fast work rate, is low maintenance with few wearing parts and enables overseeding to be undertaken without taking ground out of play. Further enhancing his turf maintenance procedures, Nathan uses the SISIS Javelin Aer-Aid 1500, which is a tractor mounted vertical action air injection aerator. Its air injection tines are specially designed to use the maximum air available from the compressor. “We use the Javelin Aer-Aid every time we get a decent break in between games and that is all about trying to keep the pitch regulated in terms of how hard and how soft it is. “The option of the air injection has proved to be invaluable to us. In a stadium environment we don’t get a lot of natural air movement or sunlight so the water movement isn’t particularly good. Unfortunately the pitch used to sit damp on a regular basis, so being able to inject the air helps prevent any problems like black layer. It’s also great for helping to reduce the compaction from using the heavier machinery on the pitch. For general all-round maintenance Nathan also purchased the SISIS Twinplay frame which accepts a variety of different implements for use on both turf and synthetic surfaces. Implements such as grooming rakes, spikers, slitters, rollers and brushes can be added to the frame making this an exceptionally versatile piece of equipment. Nathan is particularly impressed. “For our SISIS Twinplay frame we’ve got a spiker reel, a brush and two sets of rakes which are used for general maintenance – whether it is cleaning the pitch out, surface aeration, or just to help control any algae or thatch build-up that we might get. The Twinplay will go out on the pitch pretty much after every single game. “I’d highly recommend SISIS equipment – it’s very effective and it’s not been over complicated with hydraulics. They’re also really robust and well made. “Overall they are great bits of kit and you don’t require big tractors to run them – with just a 20-25HP tractor you can utilise almost every bit of kit on the shelf that they have at SISIS,” he said.